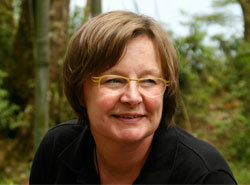 Dr. Rieki Crins,cultural anthropologist, has spent the last two decades developing her expertise in, and interacting with the people of the Himalayan kingdom of Bhutan. She obtained her PhD on Gender and Sustainability in Bhutan in 2008 at the University of Humanistic Studies, Utrecht and has written many articles as well as two books on Bhutan. Dr. Crins is a speaker and lectures at universities and institutions such as Oxford University, University of Amsterdam, Siam Society in Bangkok Thailand, the TBLI conference among others. Next to her academic work, she co-founded the TBLI Group financial consultation institute, together with her husband Robert Rubinstein in 1999. TBLI Group was one of the first companies to introduce the concept of sustainable investing. TBLI Group, with TBLI Conference and TBLI Consulting are its working enterprises, to carry out the mission of mobilizing capital for sustainable investment. The TBLI Conference organizes the largest, most prestigious international networking and education opportunities on ESG and investing in the world. For 4 years Rieki was the conference manager for TBLI Group and organised conferences throughout Europe and Asia. For the last 18 years Rieki has designed and guided high end educational and cultural trips to Bhutan, the Eastern Himalaya (Sikkim), Rajasthan and earlier trips in Zimbabwe and Botswana. Her extensive travels and experience inspired her most recent project; the melding of her passion for true sustainability in the tourist sector with preservation of cultural heritage, zero emission building practicing, and creating jobs. She is now transforming this dream to reality by setting up a quality Ecolodge in central Bhutan and a community hospitality college where local Bhutanese will learn to be successful professional hoteliers. In support of this, Rieki create the Learning Exchange Foundation in 2009 The aim of Learning Exchange Foundation is to raise awareness of Bhutanese culture in the West and as well as to learn from and experience and learn from their unique holistic lifestyle and world-view. Simultaneously the western cultures can bring expertise to Bhutanese institutions and companies in need of know-how to render their work more professional as well as sustainable. The first project of the foundation was a leadership training in Bumthang for 40 unemployed youth in 2012, secondly exchange of knowledge by inviting young Bhutanese for capacity building to The Netherlands, sending expertise to Bhutan and in March 2015 the opening of the Bongde Institute of Hospitalty and Tourism.